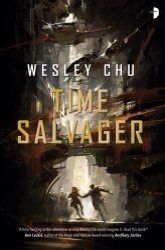 Time travel sounds like fun but every iteration on the theme ends up bad, from a paradox where a kid born 20 years after you is your father (John Conner); having your own mother crush on you (Marty McFly); to going crazy watching the world die, as is the case for the protagonist in Wesley Chu’s inventive Time Salvager. Chu has created an evocative future dystopia where humanity has nearly destroyed both itself and it’s habitats through constant war and consumption. The last dregs of the human race are forced to rely on Chronmen; trained time travellers who jump back into the past to retrieve valuable commodities such as raw materials and power sources. James Griffin-Mars is just one of those revered and feared men. People with exceptional technological powers whose minds are slightly unhinged. Forced to leap back in time into disasters and conflicts of the past where the robberies they enact won’t disrupt the time continuum, these Chronmen must constantly deal with death at every turn. Sometimes, it becomes too much. For James, who becomes enamoured with a women 400 years in the past, the pressure results in him breaking the first, and fundamental time law – bringing someone back into the future. The cascading result of which powers the novel along at a brilliant clip. Suddenly, the time laws seem less than set in stone and the agency of the Chronmen, who swear to uphold them, less than pure in the meddling with history. Chu’s world building is exemplary and the whole premise really gripped my imagination from the start. The ensuing story, of a man haunted by so many ghosts and starting to unravel yet trying to become a better person, is well handled. The cat and mouse nature of the plot is exciting and though I felt the book got a little bogged down towards the last quarter, the potential for more tales within this universe is clear. Whilst, to me, it seemed Chu was anxious to show his actors’ developments, I felt that he didn’t really need to drive it home as much as he did – I was already invested enough to comprehend the changes. The main characters were nicely filled out and the logic of the time travel system was cleverly thought through. Time Salvager is an excellent read with a truly interesting concept driving the story, and I hope Wesley Chu revisits this fascinating scenario again. Ernie Cline does an amazing line in retro 80s reference loaded literature for those of you (*cough* me included) who are old enough to remember it in all it’s glory first hand. Much like his debut novel, Ready Player One, Cline uses those pop culture icons as landmarks to highlight his story. Yet, in Armada, the films, music and video games he name checks all add up to become tropes for the self aware protagonist – one, very coolly named, Zack Lightman. 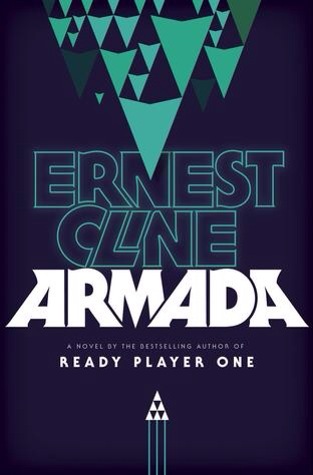 Armada, in fact, reads very much like one of those epic 80s films I grew up on. Like The Last Starfighter or Wargames, we see a high school kid embroiled in a race to save humanity from the brink of destruction. Cline has, somewhat masterfully, created a meta-80s novel that both embraces those tropes yet remains aware of them, never falling into mimicry nor failing to reflect upon them. The novel is a fast read and the writing is fluid, filled with brilliant dialogue, a solid cast and lots of action. It’s pretty breathtakingly non-stop really and that’s no bad thing. Zack enters stage right and we’re given his back story – a gamer nerd with a temper who lost his dad while still a baby. Soon, that feeling that he’s meant for something more comes to fruition and he’s whisked away to defend Earth from an alien invasion. Lo and behold it’s because of his skills as a virtual fighter which makes him one of the best of the best and most able to help pilot attack drones against the invading force. For me it was hugely enjoyable, especially the big dose of 80s- esque story that Armada serves up. It’s straightforward fun with little twist or turns but just like the movies it references, it’s awesome. On the verge of adulthood, Rafi attends the Lyceum, a school for the psionically gifted. Rafi possesses mental abilities that might benefit people . . . or control them. Some wish to help Rafi wield his powers responsibly; others see him as a threat to be contained. Rafi’s only freedom at the Lyceum is Wallrunning: a game of speed and agility played on vast vertical surfaces riddled with variable gravity fields. Serendipity and Ntenman are also students at the Lyceum, but unlike Rafi they come from communities where such abilities are valued. Serendipity finds the Lyceum as much a prison as a school, and she yearns for a meaningful life beyond its gates. Ntenman, with his quick tongue, quicker mind, and a willingness to bend if not break the rules, has no problem fitting in. But he too has his reasons for wanting to escape. Now the three friends are about to experience a moment of violent change as seething tensions between rival star-faring civilizations come to a head. For Serendipity, it will challenge her ideas of community and self. For Ntenman, it will open new opportunities and new dangers. And for Rafi, given a chance to train with some of the best Wallrunners in the galaxy, it will lead to the discovery that there is more to Wallrunning than he ever suspected . . . and more to himself than he ever dreamed. 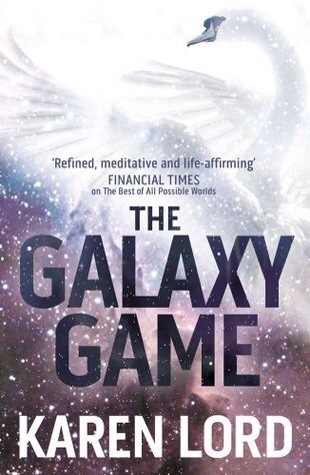 The Galaxy Game is an awe inspiring study of human relations both large scale and small. From the innocent and sweet interactions of new friendship to the cultural and political clashes between differing interplanetary factions, this is a novel that moves and flows under the beat if it’s own drum. Lord’s style is very different from the action packed machinations of normal space operas. It has a lyricism and poetry that is engrossing, and a descriptive palette that draws amazing pictures for the reader to ponder. The Galaxy Game employs a number of different perspectives and ways of presenting those character arcs, from the first person to the third person and each thread weaves into a strange and beautiful narrative. It is one that considers the socio-political upheaval of terrorism, the responsibility of humanity couched within cultural and economical society but also of the individual and his/her own story of love,loss and growth in the chaos of this sublime greatness that is life. Karen Lord is clearly amazingly talented and her work is highly worth reading and taking the time to consider. This is not a novel to tear through on the train but one to linger upon and unravel. The effort will be rewarded tenfold.